Intel Security tracks $100,000 in targeted hospital ransomware payments through suspect Bitcoin accounts. Intel Security survey shows healthcare and manufacturing sectors are among the least prepared to prevent data loss. More than 25 percent of companies surveyed do not monitor sharing of or access to employee or customer data. Only 37 percent of organizations surveyed use endpoint monitoring of user activity and physical media activity. Ninety percent of respondents have cloud protection strategies, but only 12 percent have visibility into data activity in the cloud. New mobile malware reaches highest level recorded in Q2 2016; total mobile malware grows 151 percent year over year. Total ransomware grows 128 percent year over year; macro malware grows 106 percent. SANTA CLARA, Calif., Sept. 14, 2016 – Intel Security today released its McAfee Labs Threats Report: September 2016, which assesses the growing ransomware threat to the healthcare industry; surveys the “who and how” of data loss; explains the practical application of machine learning in cybersecurity; and details the growth of ransomware, mobile malware, macro malware, and other threats in Q2 2016. Following a rash of targeted ransomware attacks upon hospitals in early 2016, Intel Security investigated the attacks, the ransomware networks behind them, and the payment structures enabling cybercriminals to monetize their malicious activity. The researchers identified nearly $100,000 in payments from hospital ransomware victims to specific bitcoin accounts. While healthcare is still clearly a small proportion of the overall ransomware ‘business,’ McAfee Labs expects a growing number of new industry sectors to be targeted by the extensive networks launching such attacks. In the first half of 2016, McAfee researchers identified a ransomware author and distributor who claimed to have received $121 million (BTC 189,813) in payments from ransomware operations targeting a variety of sectors. Dark net discussion board communications with network affiliates suggest that this particular cybercrime actor had accumulated profits of $94 million during the first six months of this year. The scale of the operation is in line with research McAfee Labs conducted with its Cyber Threat Alliance partners in late October 2015, when the group uncovered a ransomware operation using the CryptoWall ransomware strain to extort nearly $325 million over the course of two months. The research team attributes the increased focus on hospitals to such organizations’ reliance on legacy IT systems, medical devices with weak or no security, third-party services that may be common across multiple organizations and the need for hospitals to have immediate access to information to deliver the best possible patient care. 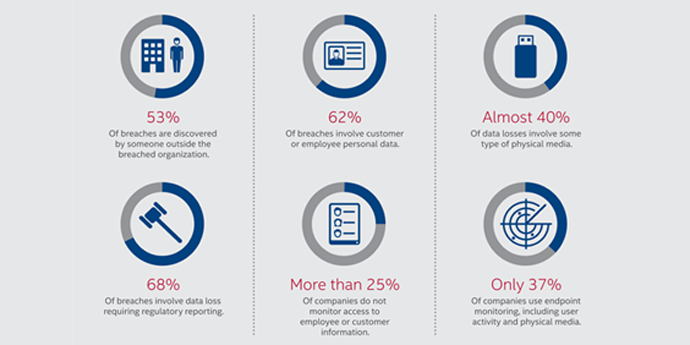 The Q2 report also features the results of a primary research study assessing data loss incidents, including the types of data leaking out, the ways data exits organizations, and the steps organizations must take to take to improve the capabilities of data loss prevention. The survey found that retail and financial services organizations have deployed the most extensive protections against data loss, a finding McAfee Labs attributes to organizational responses to the frequency of cyber-attacks and the value of the data held by companies in these two sectors. Having sustained fewer cyber-attacks historically, healthcare and manufacturing enterprises have made fewer IT security investments and, accordingly, possess the least comprehensive data protection capabilities. The weaker defenses in these two sectors are particularly disturbing given that cybercriminals continue to shift their focus from easily replaceable payment card numbers to less perishable data such as personally identifiable information, personal health records, intellectual property, and business confidential information. The research revealed that more than 25 percent of respondents do not monitor the sharing of or access to sensitive employee or customer information, and only 37 percent monitor the usage of both, although this figure rises to almost 50 percent for the largest organizations. The survey results also show that nearly 40 percent of data losses involve some kind of physical media, such as thumb drives, but only 37 percent of organizations use endpoint monitoring of user activity and physical media connections that could counter such incidents. While 90 percent of respondents claim to have implemented cloud protection strategies, only 12 percent are confident in their visibility into the activity of their data in the cloud. The 1.3 million new ransomware samples in Q2 2016 were the highest ever recorded since McAfee Labs began tracking this type of threat. Total ransomware has increased 128 percent in the past year. Mobile malware. The nearly 2 million new mobile malware samples were the highest ever recorded by McAfee Labs. Total mobile malware has grown 151 percent in the past year. Macro malware. New downloader Trojans such as Necurs and Dridex delivering Locky ransomware drove a more than 200 percent increase in new macro malware in Q2. Mac OS malware. The diminished activity from the OSX.Trojan.Gen adware family dropped new Mac OS malware detections by 70 percent in the second quarter. Botnet activity. Wapomi, which delivers worms and downloaders, increased by 8 percent in Q2. Last quarter’s second most active botnet, Muieblackcat, which opens the door to exploits, fell by 11 percent. Network Attacks. Assessing the volume of network attacks in Q2, denial-of-service attacks gained 11 percent in the quarter to move into first place. Browser attacks dropped by 8 percent from Q1. These most prominent attack types were followed by brute force, SSL, DNS, Scan, backdoor, and others. For more information on these focus topics, or more threat landscape statistics for Q2 2016, visit www.mcafee.com for the full report.